Most people believe they can recycle pretty much anything made out of plastic. That couldn't be farther from the truth. Turns out, certain plastics are harder to recycle than others. In fact, some states won't even accept certain plastics for pick up. I live in New York, so when I did a little digging, I found out plastic wrap was a non-recyclable. This struck a cord with me because I'm relatively new to joining the zero waste community and still have plastic wrap in my home. I realized my folks and I use a lot of plastic wrap and it really got me thinking about how much waste I was contributing to the environment. Every time I opened my fridge, at least one item was covered in plastic wrap. That needed to change, ASAP. And that's where Bees Wrap comes in. You might have heard of them before (BuzzFeed just featured them not too long ago). I don't recommend this brand to you if you're vegan (seeing as the product contains beeswax), but for all non-vegans, this is the perfect alternative to plastic wrap. 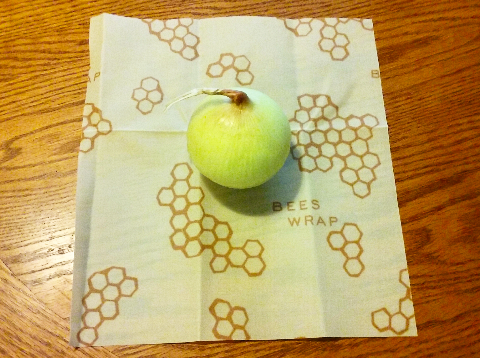 Essentially, Bees Wrap is a reusable wrap made from organic cotton, beeswax, organic jojoba oil, and tree resin. It can be used to wrap anything from half an avocado to a loaf of bread (depending on the size you get). There are several sizes available, such as small, medium, and large. They also have bread and sandwich wraps. You can choose to buy just single wraps (one wrap on it's own with your chosen size), or 3-packs (which can contain just one specific size, or a variety of sizes). Each size can be used to wrap something as small as kiwi to as big as half a melon. Bees Wrap was generous enough to send me a few samples to try out. I received their lovely assorted pack, which has 3 different sizes of Bees Wrap in it. Honestly, if you're new to Bees Wrap, I really recommend getting that pack only because you will be able to see which size is most convenient for you. For example, not everyone uses plastic wrap to wrap huge items: Most of the time, they might be wrapping small items. If that's the case, the small or medium sized wrap would work best for them. That's why I was so excited to try out the assorted pack: I'd quickly learn which size I liked best and which I used most. But enough chit chat. Want to see the different sized wraps for yourself and what I thought? Keep reading. 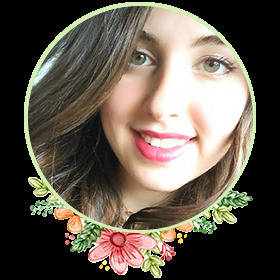 First, I'd like to share with you a few important pieces of information about Bees Wrap. 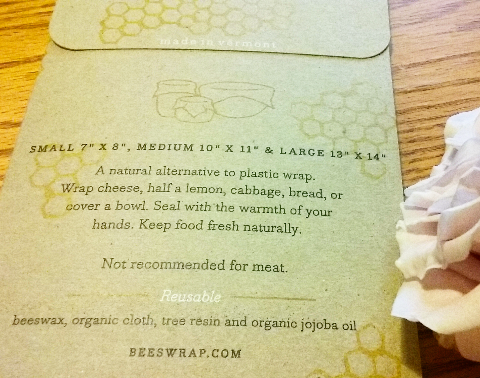 Here's everything you need to know about ingredients, usage, and care of Bees Wrap. To be honest, it's pretty simple stuff. And while I don't recommend this product for vegans, I do want to stress that the beeswax is sustainably harvested in the USA. So that's a relief! Organic cotton, beeswax, organic jojoba oil, and tree resin. The assorted pack I got costs $19, but each 3-pack costs a different amount of money, based on size and print. Generally speaking 3-packs range from $16 to $19. If you'd like a single wrap, those range from $6 to $15, depending on the size. All bread wraps are $15 and all sandwich wraps are $10. Please be aware at the time of writing this review, Bees Wrap is temporarily out of stock due to publicity from Buzz Feed's video. They're working on producing more products as we speak! Just fold/secure the wrap around your item as you would with plastic wrap. Use the warmth of your hands to soften the wrap, and create a seal. This literally takes a few seconds. When cool, the wrap holds its shape. Since it's reusable, you can keep it for up to 1 year or longer (if used correctly). All you have to do is wash it in cool water after each use. If something is sticking to it a lot, just scrub off using a sponge and mild dish soap. Then, let it dry (I just let it air dry on a towel I placed on the counter). Once dried, you can use it again immediately! Or, store it in a drawer or basket in the kitchen until you need it again. 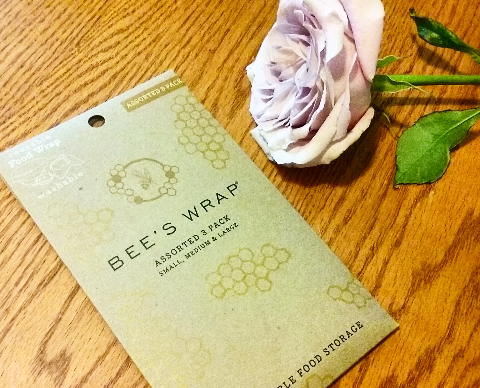 When Bees Wrap reaches the end of its usage (approximately 1 year from purchase), it's biodegradable and compostable. 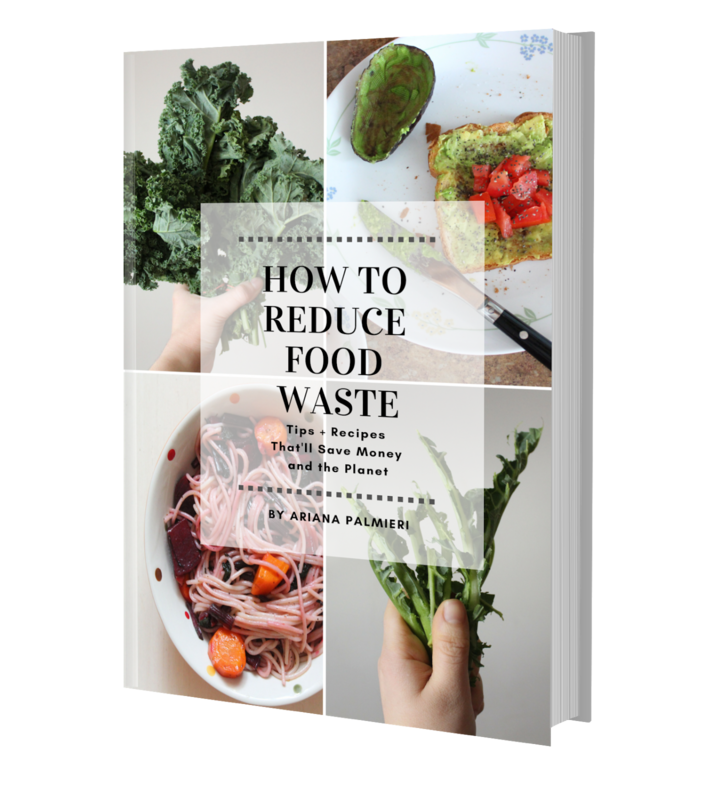 That means you have a couple of options: Cut the wrap into strips to add to your compost heap, or wrap them around pieces of kindling and use as a natural and effective fire starter. Totally up to you, just don't send it to the landfill! Not recommended for storing meat. Also, since this is used to store food, Bees Wrap does not accept returns. This 3-pack comes with a mix of different sizes: 1 small, 1 medium, and 1 large. I'm going to show you each size that comes with the assorted pack, and what I used it for. This will give you a general sense of how big each wrap was and what you could possibly use it for. 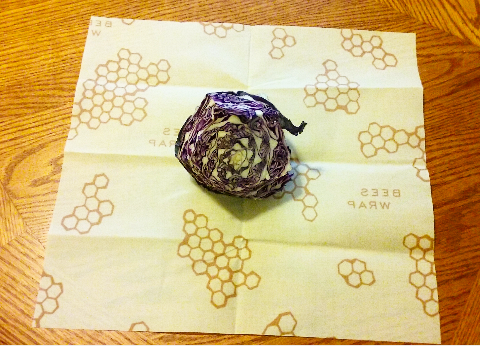 Here's the cabbage on the large Bees Wrap. It was the biggest thing I had in my fridge at the moment, and it really needed Bees Wrap. So yeah, that's why I decided to use it. Want to see it all wrapped up? Not much to look at, I know. But still, this is how it looked wrapped. To wrap it, I simply used the warmth of my hands to seal it in place. When cool, the wrap naturally holds its shape. Definitely cuter than plastic wrap. The only disadvantage is that you can't actually see the item. That's okay though, I simply placed this cabbage in a separate area (in the fridge) away from the other items covered in Bees Wrap. Oh, and also, this stuff has a very pleasing, beeswax scent to it. Nothing overpowering (I read it fades with time and after use), but just thought I'd let you all know in advance. As you can see, it does a great job at covering the cabbage. In fact, it could definitely cover something bigger because there's a lot of excess wrap (meaning if the cabbage would've been bigger, it would've been able to cover it too). Tada! Okay, yes, not very impressive. But whatever, here's the onion. So now, I just wrapped it up like I did with the cabbage. Easy-peasy. Here it is! A wrapped onion. Oh, and if you're curious, I used the onion skins to dye some eggs orange for Easter (that's why this onion didn't have any skin on it). And unlike the red cabbage, it did work (the orange was a deep color and so pretty). Anyway, I digress. I stored this in the fridge right away but made sure I didn't place it next to the cabbage (might've gotten a little confusing). As you can see, it does a great job of covering the entire onion. Okay, so this small size was my absolute favorite. And not because I didn't use the other two: I did. It's just, I found myself using this one more. It measures 7" x 8" and can be used to wrap a lemon, avocado or small snack. I decided to wrap a slice of cantaloupe in it. I know this wrap couldn't cover an entire cantaloupe, or even half one for that matter. That said, there was a lonely slice in my fridge and I figured I'd give it some love. Okay, so the cantaloupe is now on the wrap. As you can see, it's kind of big for this small wrap. In reality, I probably should've used a medium sized wrap on this, but I was determined to make it work. So, when I wrapped this one, I kind of had to wrap it from the top. I didn't care so much about wrapping the bottom part: Just as long as the top of the fruit was covered, it would stay fresh. Want to see my wrap job? It's not too pretty, but it got the job done. Tadaaaa! I know, I have to stop saying that. 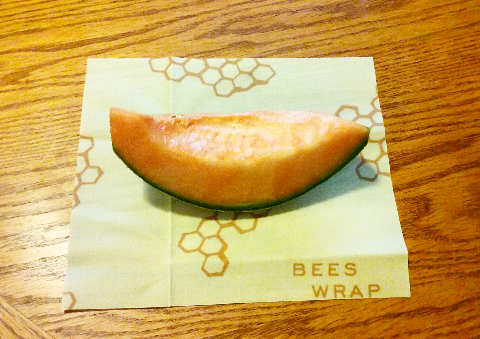 But yup, here's the cantaloupe wrapped in Bees Wrap. As you can see, I did a pretty decent job with it! I made sure it was as covered as possible. While you can't see it in this picture, the bottom of the cantaloupe was a little exposed. But that's okay: What mattered most was covering the top, and it worked! Suffice it to say that cantaloupe stood fresh. My mom actually got to it before me (sadly). But it's alright: I was able to wash the wrap off in cool water and let it dry for my next use. In fact, I used this again today on half an avocado. I wrapped it without problem, covering the entire halved avocado. The other half of the avocado was generously donated to my toast. Left to right: Cantaloupe, red cabbage, and onion wrapped in Bees Wrap. The gang's all here. 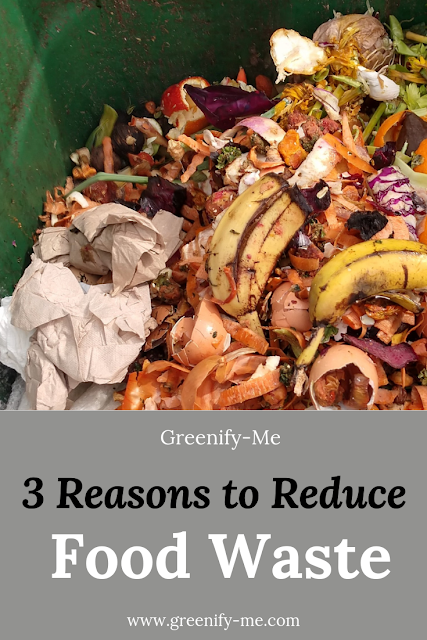 Now it's time for my overall thoughts on this zero waste alternative to plastic wrap. Well, really all I have to say is this: Bees Wrap is brilliant. The woman who invented it is a genius (her name is Sarah Kaeck). And clearly, people are loving it (it's currently out of stock!). When it is back in stock, I plan to get more, that's for sure. I'd love to get another assorted pack and also try out one of their bread wraps. 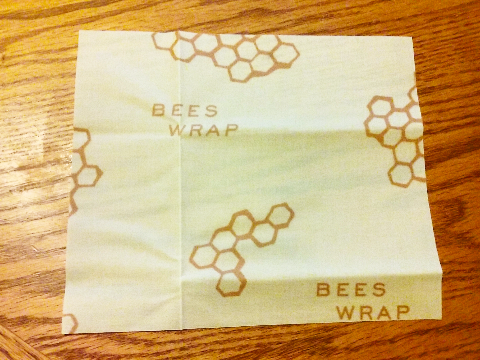 Bees Wrap is made from only 4 simple ingredients (all of which I can pronounce: Organic cotton, beeswax, organic jojoba oil, and tree resin). 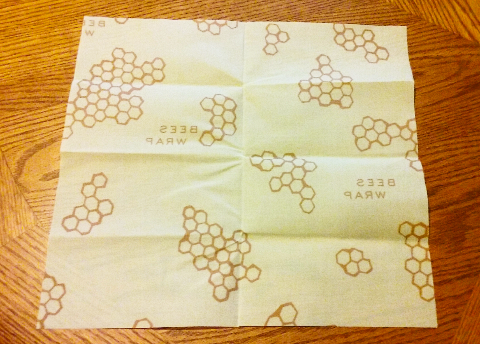 Bees Wrap is ecofriendly and zero waste because it can be reused and is biodegrable - when mine is no longer usable, I'm just going to rip it up and add it to compost! Heck, maybe I'll add it straight into the dirt. It really works. Food I've wrapped in it a week ago has stood fresh as the day I bought it. It's so easy to care for: Just a simple wash and dry is all it takes! 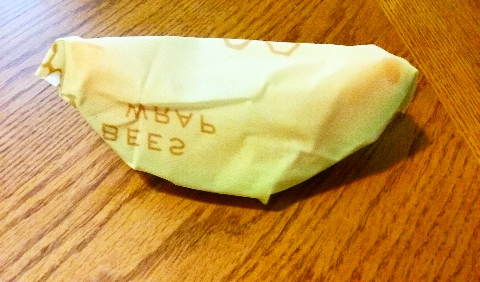 Bees Wrap isn't annoying like plastic wrap. I'm sorry, but if you're not careful with plastic wrap, it sticks to itself. Ugh. Not this. 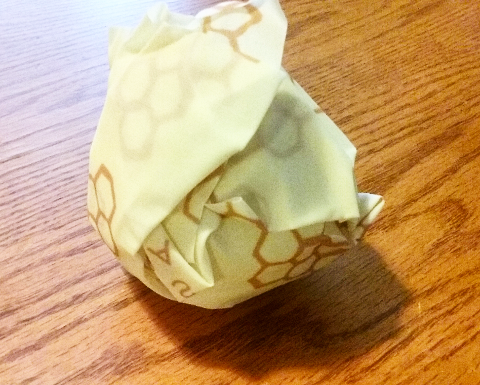 If you make a mistake with Bees Wrap, you don't have to throw it out and start all over again. Just saying. I'm majorly cutting back plastic waste by owning these - and I'll cut back even more when they restock (and I can buy more)! I loved the assorted 3-pack because it was the perfect way to be introduced to Bees Wrap. It really helped me see that I tend to use the small wrap most, although I could certainly use more of each. After all, you can't always predict what you'll need to wrap next or how much Bees Wrap you'll need! The best part is, if you had a really big item to wrap, you could simply use two large sized Bees Wraps (or a bread wrap). That would get the job done! I really wish I had more! The only good thing about plastic wrap is it can be adjusted to the size of the item you want to wrap. 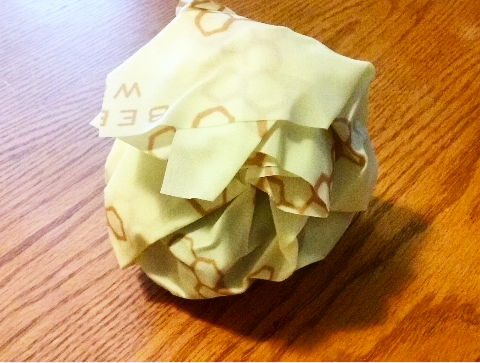 Bees Wrap cannot: It's a fixed size and that's that. 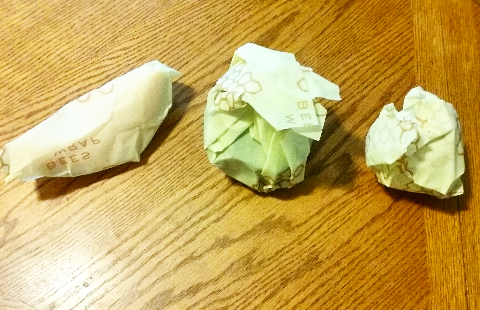 At the moment, I do not have enough Bees Wrap to completely abandon plastic wrap. 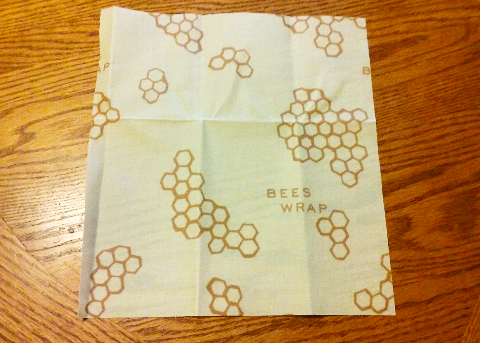 I will continue to use the Bees Wrap I do have until I can stock up on more. I will do my best to avoid using plastic wrap until then, but it sure is an annoying downside! They're currently out of stock of every kind of wrap in their shop. I know it's from the recent attention they got from Buzz Feed, but come on Bees Wrap! I need more of you in my life! It's not vegan. While that's not a problem for me, I could see where it might be for others. That said, there are worse non-vegan items out there besides beeswax (like gelatin - shivers). All together, I really did enjoy this experience and cannot wait to get more Bees Wrap in my hands. And yes, I mean that literally. If you'd like to get your own, here's a link to the assorted pack I got. I suggest following Bees Wrap's Facebook, Instagram, and Twitter accounts to get updates on when they restock. In the meantime, stay green my friends.